Lake Titicaca, or in Spanish Lago Titicaca, is a dazzling body of azure water located at 12,507 feet above sea level, making it the highest navigable lake in the world. It’s located on the border of Peru and Bolivia and steeped in history and culture. A visit to Lake Titicaca can either leave you in awe of the authenticity that still exists in this remote land or frustrated by the “dog and pony show” created by the harsh clash of tourism. My first trip displayed much of the latter, unfortunately. While in Peru in 2005 my dad and I traveled first to Machu Picchu and the Sacred Valley and then made our way through the high desert landscape to Lake Titicaca, arriving on the shores of a town named Puno. After seeing the splendor of Spanish colonial architecture blended with Incan ruins that is Cusco, many will agree that Puno is nothing to write home about. There is a small main plaza that’s nice, but mainly the town consists of concrete blocks that house just so-so hotels and restaurants. Nevertheless, arriving after a long day of travel, we appreciated any pillow under our heads and an edible meal. The next morning we set out to see the famous Uros Islands. The Uru people are an ethnic group that descended from a pre-Incan civilization who, according to legend, believed themselves to be the owners of the lake and water. For defense reasons they constructed floating islands made of reeds that could be easily moved if threat arose. Traditionally, the Uru people’s lifestyle revolved around the same totora reeds they use to construct their islands. They were used for medicine, food, and material for their reed boats to transport them to shore in order to trade with the Aymara people on the mainland. Maintaining the islands takes a lot of effort; the reeds break up when they are walked upon and, as moisture gets to them, they rot. New layers need to be added all the time, but because many of the islands are so infiltrated with tourists now, it’s hard for the residents to find the time. There are about 42 floating islands on Lake Titicaca and my dad and I visited some of the closest to Puno. We watched the women in their colorful skirts and plaited braids cook and the men construct a reed boat. They sheepishly hid the buoyancy method they were employing of reusing old plastic soda bottles to fill the center of the craft (which I thought was ingenious!). If you did a little digging, you found out that the larger islands house schools and medical clinics now, often made out of corrugated tin, and that there is even an Uru FM radio station. On these islands it is definitely expected that you pay a couple pesos for every photo taken. These discoveries made me feel a little conned at first. But, even as I write this now, I ask “who am I to judge that?” Of course the Uru people want and deserve healthcare and education. Why should they not attach motors to their reed boats? Or drink Coca-Cola? It was truly amazing to have a window into this way of life, to meet the warm and smiling Uru people. I realized I shouldn’t feel disenchanted by the experience because their culture hadn’t been frozen in time. In fact, I found myself more intrigued and interested by the process of modernization than anything. I just hope that their customs and values are being passed down to their children for the right reasons and with pride – not to just make a buck off a tourist. 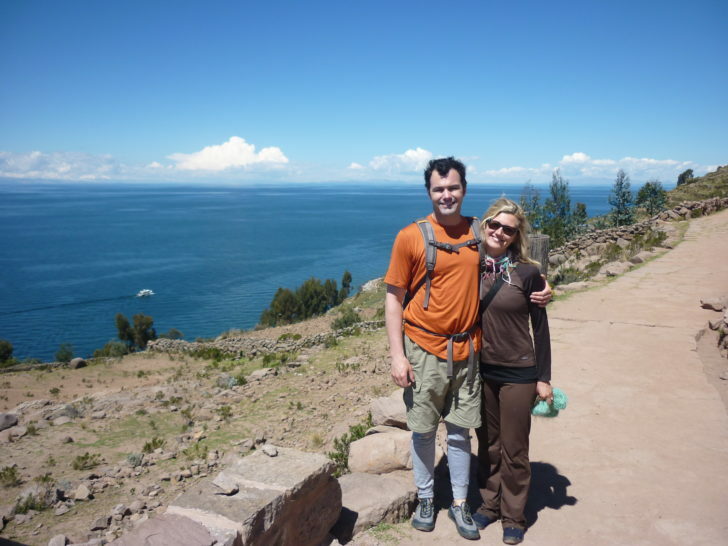 My second trip to Lake Titicaca was six years later with my husband, Jordan, on a scouting trip for Knowmad Adventures. Although I had come to terms with my first visit to the Uros, this time we were searching for something off-the-beaten path and genuinely authentic – a whole different way of experiencing Lake Titicaca. It wasn’t long before we found ourselves bouncing along on a shared minibus to Llachon in search of Valentin – a Quechuan man we had heard was doing kayaking trips on Lake Titicaca. We edged our way north around the lake, passing through remote landscape that offered us snapshots into daily life here – a woman in a red bringing hay to her sheep, a matted burro tethered to the earth, old men waiting in the plaza with their wives. Valentin greeted us with a cup of hot mate, and conversation naturally turned to tourism. He explained his philosophy for welcoming travelers into his home. He hit the nail on the head and we slept well that night, happy with anticipation for the kayaking excursion to Taquile Island the next day. What a marvelous way to experience Lake Titicaca! After breakfast we geared up and set out to kayak to Taquile Island. 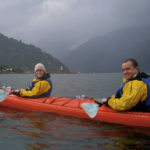 The paddle wasn’t too strenuous – just a couple of hours – and we stuck fairly close to the shore for most of it, paddling through the totora reeds with vistas of ancient pre-Incan terraces. We observed the farmers on land and fishermen on water, really getting a sense of how life depends on this body of water here. No wonder the spiritual connection was so strong. For us, the fresh air was invigorating and the paddling motion made our rushed, stressed life at home truly seem a million miles away. On Taquile Island we wove our way up the stone stairs, passing young men weaving hats along the way. As the story goes, when courting a lady on Taquile Island, the young men have to prove their worthiness by tightly knitting a wool hat. The could-be-future in-laws test his skill by pouring water into the hat – if it holds he’ll make a good husband. We passed through the arched walkways, taking photographs along the way of the spectacular views of Lake Titicaca, and arrived to the main square where we even met the mayor! With our stomachs grumbling we reached Donde Alejendro or “where Alejandro is.” Alejandro, opens his home to travelers for meals and home stays, and is one of the island’s most renowned knitters. For lunch, we feasted on freshly caught fish, corn, all kinds of potatoes and vegetables – all grown right there on the island. We left more than satisfecho and promptly created the Kayaking Lake Titicaca and Cultures of Titicaca itineraries inspired by these experiences. 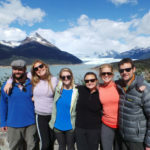 In travel experiences with Knowmad we try to foster real connections with people, to create a cultural exchange that is beneficial for both sides. 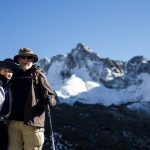 We sum up our travel philosophy as active, authentic and sustainable and get questioned about what we mean by “sustainable.” It’s such a buzz word these days that it often gets overused. Of course, we always take measures to be environmentally sustainable in our trips, but we also really focus on being culturally sustainable. Projects like Valentin’s kayaking operation on Lake Titicaca, that we proudly work to grow with our sister company and partners Explorandes and the Association of Rural Tourism of Llachon, perfectly exemplifies our mission. Have you ever made a connection while traveling that helped you to grow? How have your travel experiences changed your world perspective? Discover more about Knowmad’s travel philosophy.